Rated 2 out of 5 by PlayeRex from Boring & monotonous This is an aggravating TM game. You're expected to fill flower orders, some of which involve potting or wrapping them. Not only can you do only one order at a time, but you also can't start a wrap or pot & set it aside for later so you can pick up another order. I don't know why the character can't seem to carry more than one object at a time, but that's not exactly practical or challenging. I've only played 6 levels of the demo, but I don't want to waste a credit to find out if this game gets better, because I'm betting it doesn't. Rated 2 out of 5 by karema from boring i love tm games but this one wasnt for me. it's a clickfest, and that's about it. the graphics are clear and bright but the music is annoying. there isn't much of a story. i gave it a chance and played the first 5 levels hoping they would get better, but they didn't. each new level just required you to click faster...i knew that i wouldn't be able to keep up with all that frantic clicking so i quit...more tm please, like the delicious emily series, not like this one. try it, you may like it more than i did. 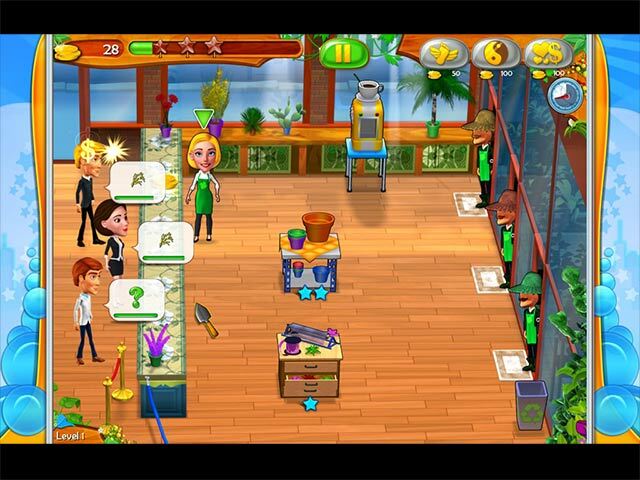 Rated 2 out of 5 by pennmom36 from It's Not Difficult To Manage Your Time In This Flower Shop There are 70 levels available in this Time Management, sadly, I could barely make it through 4 levels, because it's too boring. Chloe has asked Angela to work in her garden shop while she's on vacation, so you get a quick tutorial to bring you up to speed before she leaves for some much needed R & R. The tasks are simple and monotonous, to make matters worse, you are forced to complete one customer's order completely before you can go onto the next order. You must click on a customer to find out what flowers they want to purchase, then you click on the gardner and select the type of flower the customer indicated they want, and the gardner disappears into the greenhouse. 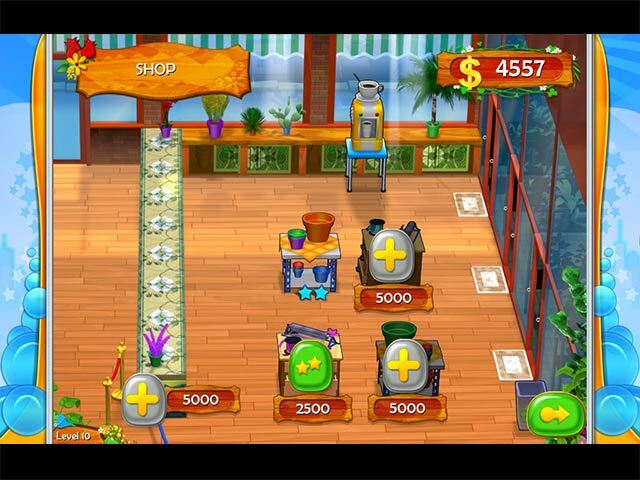 There is a metered icon indicating how long it takes for the gardener to finish his masterpiece, when he is finished you click on the gardener to get the flowers, and then click on the correct customer to deliver the flowers, and click on the money to collect it. You can click on the next customer, but you cannot queue up multiple tasks (unless this is an option later in the game) because you have to wait for the gardener to complete the first task before giving him another order, and this was a huge disappointment for me. The money you earn can be used to purchase upgrades that will help you work faster. The upgrades are the normal upgrades found in most Time Management games, where you purchase extra counter space to serve more customers or even a pot workshop. The pot workshop allows you to combine a flower pot with the flowers, if that is what the customers desire. When you click on the pot workshop you get a pop up window that gives you three different types of flowerpots to choose from, which is then taken to the gardener to place the flowers he ordered into the pot. That's all the further I got, I just didn't have any fun playing this game. There is a Rush mode that will be unlocked eventually as you progress. Perhaps you will find the game more interesting, but I just can't recommend this game. 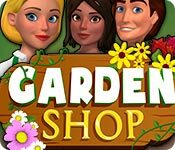 Rated 2 out of 5 by biscuitsmama from A VERY BASIC OLD SCHOOLTM GAME I don’t know why Garden Shop seems so familiar but it feels like I played this game years ago. If not, then this developer has revamped an old game. If the game is new, it sure seems like an old school TM game. The graphics seem colorful but the game opened with patterned bars on either side of the play area. There are no voiceovers only the annoying bouncy music that would make me crazy if I bothered to play the game more than five minutes. The game is very basic and offers minimal settings so it might be a great game for someone who is just dipping into the TM types of games. 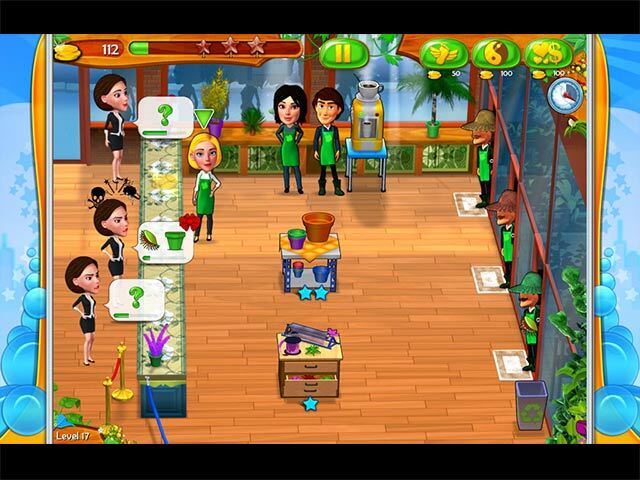 The premise of the game is to serve customers – as many as possible – and fill their orders. Pick up their money and then buy more items for your shop. Yep that’s about it and I could just see myself becoming extremely bored in ten minutes or less. I couldn’t play the game more than the first level and maybe there is more but I didn’t want to work in this Garden Shop any longer than my first day. As always, I recommend you at least try the demo to see if this is a game you will enjoy. Rated 1 out of 5 by Winna507 from Lynda I love TM games but this one is not up there with what i'm use to. I don't recommend this game. i wish I hadn't spent the money on it. Monotonous and way to much clicking has to be done. I also found that some customers didn't want what was made and I didn't see what was wrong with it....maybe just me but it sure looked like what they ordered. Rated 1 out of 5 by Marie_Kai from Too many errors Yes, it starts off slow. Yes, it has potential. The problem begins in about the 5th level or so when you have the additional worker. I can kind of understand the need for her; however, if she happens to stand next to the person you are delivering to you cannot deliver your item. In some cases I was able to trash it and start the item over. However, the last straw that helped me decide to trashcan the game was when even after I trashed the item and tried to switch characters to move the worker I was not able to. I would have had to start the level over. It was just easier to take the game off my mac. Rated 1 out of 5 by Indyron from Don't waste your time! Don't waste your money. It's not worth it at all. Another disappointing TM game from Big Fish Games. Sigh!!!! Rated 1 out of 5 by brimaz from WAKE ME UP.... when this slow. boring game is upgraded to make it at least a smidgen interesting. It's too repetitive and slow to be of the slightest interest to me. I love TM games, but this one left me cold.